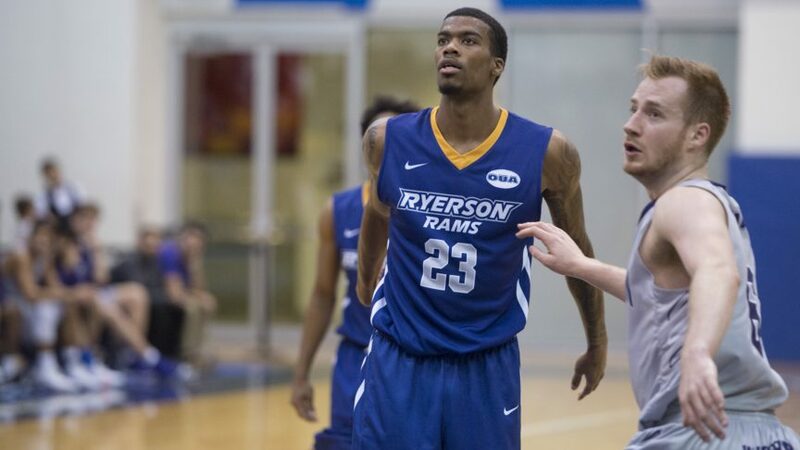 The Ryerson Rams men’s basketball team will remain undefeated heading into the break, as they took a close 77-68 win over the Lakehead Thunderwolves on Nov. 30. For most of the night, the Rams looked like they began the winter holidays a few weeks early, shooting at a low rate en route to being outscored by Lakehead in the second and third quarters. Fortunately for the road team, things would take a turn for the better. Tied at 56 with 9:48 left in the fourth, the Rams would buckle down with Jayden Frederick scoring six of his team-high 17 points in the quarter. The Rams also forced the Thunderwolves to cough up the ball 22 times on the night, and six times in the fourth to secure their tenth straight win. Despite the win, it wasn’t pretty at all for Ryerson. Struggling to score, the Rams shot their worst percentage of the season, shooting 38.7 per cent from the field and 17.9 per cent from long distance. Their three-point shooting was brutal in the second half, with the Rams managing to hit just one three-pointer on 14 attempts. Both fifth-year guards, Myles Charvis and Jean-Victor Mukama struggled from beyond the arc. On the season, Charvis is shooting 37 per cent from three while Mukama is shooting 38.9 per cent, but in their final game until January, they combined to shoot 0-11 from deep. Even though Mukama and Charvis struggled from the field, they’ve been the catalysts to a Rams team that currently ranks second in the country. Mukama has scored in double-digits in every single game this season, while Charvis ranks second in steals, third in assists and fourth in free throw percentage in the OUA. For Lakehead, guard Isaiah Traylor led the way with 23 points and four rebounds on 6-10 shooting from the field. A heavily officiated game saw sophomore centre Tanor Ngom in foul trouble for most of the night, as he played only 14 minutes. He would still record a decent stat-line, finishing with eight points and eight blocks on 4-5 shooting. Ryerson was also without head coach Roy Rana, who’s currently leading the Canadian national team in Venezuela with Rams alumnus Aaron Best, playing in qualifiers for the upcoming 2019 FIBA Basketball World Cup. Through 10 games this season, the Rams rank first in the OUA in points per game (90.6), first in total rebounds (45.1), first in blocks (6.6), first in steals (11) and points allowed (55.8). These stats, however, will be difficult to maintain as the strength in their schedule will uptick in the second half of the season. UP NEXT: After their month-long break, the Rams will face their biggest test of the season when they take on the Carleton Ravens on Jan. 5. Tip-off is scheduled for 4 p.m.